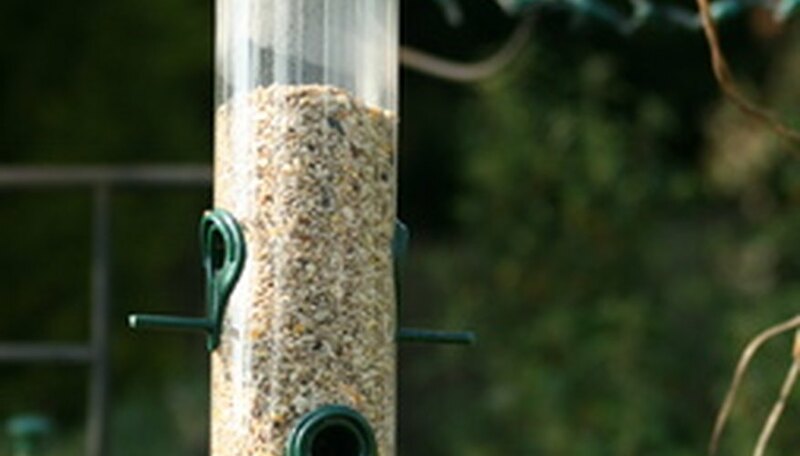 If you’ve owned an outdoor bird seed feeder, you’ve endured the patch of grass that grows under the feeder. This grass is caused by a common seed found in birdseed known as millet. Millet is a favorite snack of finches, sparrows, blackbirds, pigeons and doves. Millet seeds produce a hearty, thick summer grass that spreads quickly through runners. While you can grow a lawn using birdseed, a bag of millet seed is typically less expensive and works as well. Spread the starter fertilizer over the area to be used for planting at a rate of 20 to 30 pounds per 1,000 square feet. Till the fertilizer into the soil to a depth of 4 inches for added effectiveness. Avoid fertilizers that have any form of weed killing chemicals; they will kill off the seeds. Place the birdseed into a hand caster and spread the seed evenly over the area. The typical recommendation for spreading grass seed is 50 lbs. per 1,000 square feet. Set a rake onto the soil and walk it behind you in rows to slightly bury the seed. Roll the entire area with an empty lawn roller. This will give the seed optimal contact with the soil. Water the area immediately, saturating the soil. Follow with a light irrigation two to three times everyday to keep the ground moist. You have applied enough water when the ground is wet, but there are no pools of water. If the water begins pooling, reduce the irrigation by 5 minutes the next time. Maintain this water schedule until the grass has emerged.